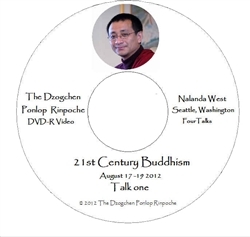 Buddhism in the 21st Century, DVD, 3 talks with The Dzogchen Ponlop Rinpoche, and 1 discussion with the Nalandabodhi Mitras. Is there an essence of Buddha's teachings that transcends culture and time? As witnesses to and participants in a rapidly changing global culture, what practices should we focus on in our busy lives? As modern Buddhists, is there anything we have been forgetting from the Buddha's original teachings? Dzogchen Ponlop Rinpoche explores these questions and further discusses what it means to have a heart of dharma in the modern world, while being supported by dharmic containers.